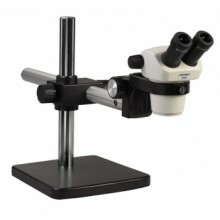 The Unitron Z730 Series with a 4.3:1 zoom ratio is an ideal choice for industrial inspection, assembly, quality control, OEM integration, research and education applications.Featuring outstanding optics and a large field of view with a high depth of focus, the Z730 reduces sample handling times allowing for faster inspections and a more efficient work process. Viewing Angle 45 degrees for binocular and trinocular models. Boom Stand Base dimensions: 254mm x 254mm (10" x 10"),Vertical Post - 365mm, Horizontal Post - 518mm. Click the button below to add the Unitron Z730 Stereo Series on Boom Stand - 7x - 30x Magnification to your wish list.